Over the past couple weeks, we had two huge snowstorms. We got 10 to 12" during each storm. 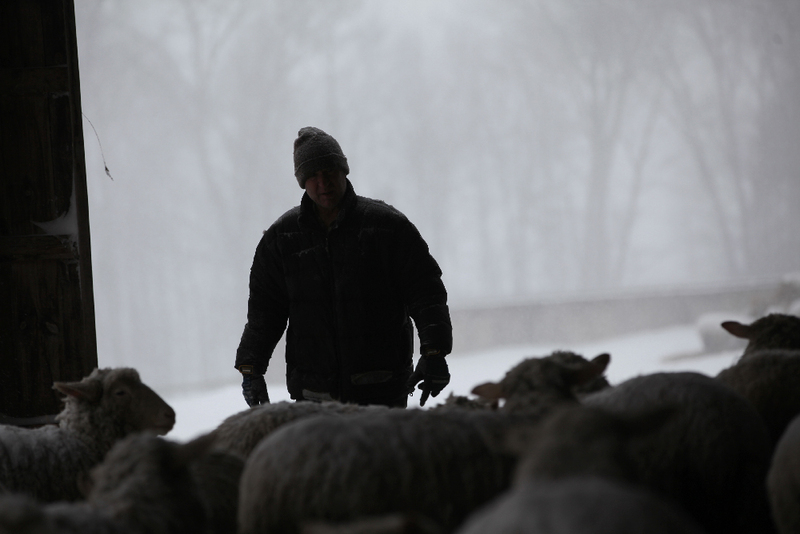 Snow makes everything - especially farming - difficult. Especially during lambing season. We don't live where our barns are - they are five miles from the farmhouse, down a long dirt farm road. We drive back and forth a lot. At least there is water and electricity at the barns now so we can use heat lamps to warm up chilled lambs, heat milk replacer in a microwave and actually see what is going on at night in the barns. 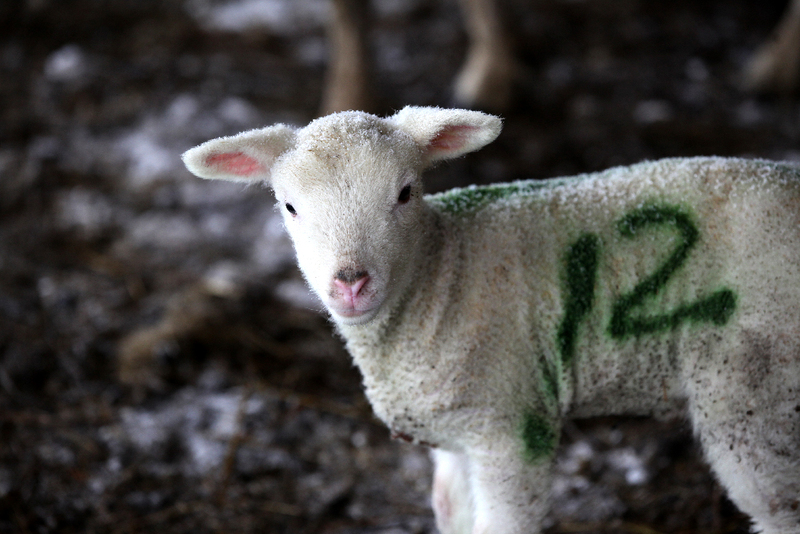 The Farmer is pretty happy with his lambing percentages this year. He has had a lot of twins - more than usual and even several sets of triplets. Triplets are good and bad - more lambs but the ewes only have two teats and often do not have enough milk to support three lambs. There is usually one triplet that doesn't fight hard enough for the milk and so needs to be bottle fed. He has been trying to figure out why so many triplets this year. He will never actually know why and we shall see if it continues next year. So far, he has 4 theories. 1. The rams were put in one month later than normal. From his research, he has learned that ewes often shed only one egg on their first estrus cycle and more often will shed multiple eggs the second estrus cycle. 2. The grass was higher in nutrition because of the weather. 3. Last year, he had smaller groups of sheep in the different pastures. Perhaps they weren't fighting as hard for the best grass. Back to the snow. 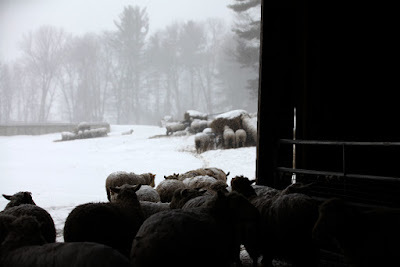 During the snowstorms, the ewes pretty much stay put in one place. Lots of them rest in the two barns but some choose to be outside. 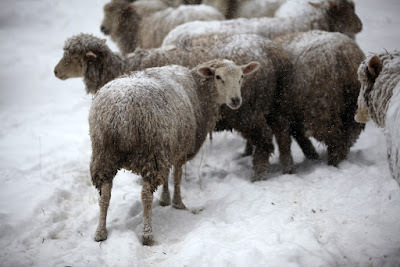 They huddle in one spot, get covered with snow and when the storm is over, stand up, shake it all off and move slowly towards the hay feeders. The ewes with lambs usually stay in the barns with their babies. The dicey thing about storms is that if a ewe decides to have a lamb outside instead of inside the warm barn, it is almost a death sentence to the little lamb. So far this year, only 2 ewes have done this - both had twins and both lost one twin to the cold. The rest of the ewes who lambed during storms or extreme cold had the sense to lamb inside. When a ewe lambs outside, The Farmer brings her in with her baby or babies. A good mama will follow her babies so it is just a slow walk with the mama just behind the lamb. Sometimes a mama will get confused and not recognize which baby is hers. Then we will take it slow -- putting the lamb down every couple feet so that the mama continues to follow. That is the report from here. One of the other farm blogs I read there were multiple births, and even a quad! Maybe something is in the air? Looks like lots of work! 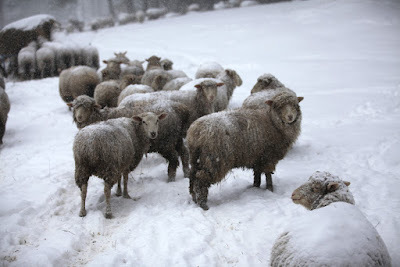 Hope you all (sheep included) stay warm! Well, at least the temps have shot up for a while! I'm actually seeing a height reduction in my Lawn-Glacier! Thankfully, the only rain we've had has been light drizzle, so the "MELT" has been manageable. Anyhoo, it's good to see that you guys have gotten through the worst of the weather and birthings. -- oh wait... MUD SEASON is just around the corner, isn't it? yeah... GOOD LUCK with THAT!